1958 Original Movie Poster The Sign of Zorro Foster William Calvin Disney YU. 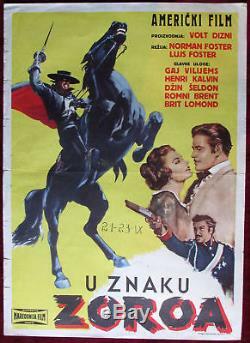 Original American movie poster The Sign of Zorro U znaku Zoroa (Serbian edition) Date: 1958. Foster, Norman Foster Writers: Norman Foster, Lowell S. Hawley Starring: Guy Williams, Henry Calvin, Gene Sheldon. Dimensions: 69,5 x 49,5 cm. Condition: Signs of folding, minor tears, pinholes, marker inscription (date and time of movie projection) Poster in Serbian language. For condition and details, see picture. Note: This is an original poster. Usually all tracking numbers will be visible by then. Sometimes its a lengthy process, especially for buyers from the US, Italy, France and Brazil. Payments will be processed via. Credit and debit cards will be processed via the mentioned processor as well. After that, the buyers will be sent a reminder and after that a case will be opened. It is possible to return an item within 30 days from the date of arrival. The item "1958 Original Movie Poster The Sign of Zorro Foster William Calvin Disney YU" is in sale since Friday, January 13, 2017. This item is in the category "Entertainment Memorabilia\Movie Memorabilia\Posters\Originals-International\1950-59". The seller is "sigedon" and is located in Belgrade. This item can be shipped worldwide.